The American Media’s failure to cover poverty as a topic is morally wrong and a failure of business ethics. First, they have an obligation to cover important subjects as part of their duty as a functioning press. They are one of the balancing mechanisms that make democracy work. Second, they are ill-serving their largest stake holders, the consumers of news by providing them with a distorted view of reality. “If it bleeds it leads,” isn’t journalism, it’s entertainment and very poor entertainment. Thirdly, they have a duty to themselves to act responsibly as human beings and to leave a legacy for others. Failure to deal intelligently and with an appropriate level of coverage of controversial topics is a business ethics failure. The Pew Research Center’s Project for Excellence in Journalism found that out of 52 mainstream media outlets analysed, coverage of poverty amounted to less than 1% of available news space from 2007 to 2012. It’s even more astonishing considering that period covered a historic recession. One of the report’s conclusions was that media organizations chose not to cover poverty because it was potentially uncomfortable to advertisers seeking to reach a wealthy consumer audience. As Barbara Ehrenreich, who contributes articles on social issues for Time Magazine, put it:They don’t want really depressing articles about misery and hardship near their ads.Poverty coverage is seen as non-lucrative, time-consuming and involves high levels of commitment that editors are unwilling to give their reporters in this age of newsroom budget tightening. The greatest irony, however, is that poverty, as Tampa Bay Times media critic, Eric Deggans, told The Nieman Foundation for Journalism at Harvard earlier this year “is in some ways the ultimate accountability story – because, often, poverty happens by design”. via About 15% of Americans live in poverty, so why is no one talking about it? | Daniel A Medina | Comment is free | theguardian.com. 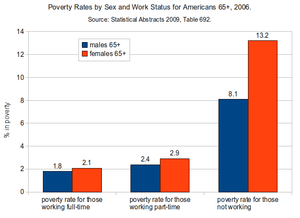 From the web site, Poverty and Policy. This is still true 50 years later for 28% of blacks, Gutting says, citing last year’s official poverty figure. And the root cause is the way our free enterprise system works. It’s geared primarily toward enabling individuals to amass personal wealth. And them’s what has gets, at the expense of them’s what don’t. Gutting asserts that “people should be free to pursue their happiness in the competitive market” — an odd conflation of happiness and riches. But, he continues, “it makes no sense to require people to compete in the market for basic goods” because if they don’t have them, they’ve “little chance of gaining them in competition” with those that do. We’ve got scads of evidence for this. For example, we’ve got research showing that more than 40% of children raised in the bottom fifth of the income scale stay there as adults — and more than half if they’re black. And other studies showing that children of wealthy parents start kindergarten ahead of the pack — and stay there, while a very large number of poor children start with disadvantages that cause them to fall further and further behind. And data showing that even the poor kids who make it through high school are far less likely to go on to college — and less likely to graduate if they do. Costs and other financial pressures are, for blacks, the single most important reason, according to yet other research. And probably not for them only. Issues of great importance to me as an Economist. Pearson’s correlation coefficient (Table 1) for income inequality and TIMSS math test score shows a negative relationship -.655 at a significance level of .002 (p<. 01) where math test score decreases with higher income inequality (or lower income equality). The relationship between income inequality and science is also negative -.631 at a significance level of .004 (p<. 05) where science test score decreases with increased inequality of income (or with decreased equality of income). Income inequality has very little relationship with government spending on primary and secondary education. Child poverty rates are significantly and positively correlated to income inequality at .787, .792 and .742 with significance levels of .000, .000 and .001. From the web site, Health Voices. Is Grand Theft Auto Unethical?